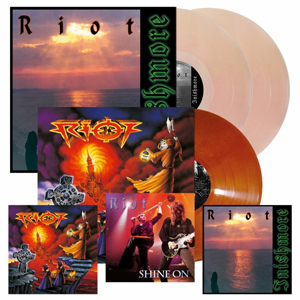 On June 30th, Metal Blade Records will release three new re-issues of RIOT's classic catalog: Inishmore, Shine On and Sons Of Society. These two studio albums (Inishmore, Sons Of Society) and live album (Shine On) are melodic power metal gems, and these new editions are a must-have for any fan's collection. All three albums have been re-mastered by Patrick Engel for optimal sound quality; the vinyl versions also include 350 g covers, an insert and free poster, while the digipak CDs include poster booklets. This is also the first time that all three records are available digitally. See below for more details about each re-issue, and pre-order your copies now at: metalblade.com/riot. Re-mastered versions of "Liberty" (from Inishmore), "Twist Of Fate" (from Sons Of Society), and "Bloodstreets" (from Shine On) are streaming below. Shine On will be available digitally, as well as on a digipak CD with the Live At Club Citta January 31st, 1998 DVD as a bonus. The DVD features a full live show, plus extra live clips and video clips!